“Annual Public Safety Youth Fishing Derby”. This derby is open to youth 8 to 12 years old. Flyers and entry/waiver forms will be made available through the Muskegon, Orchard View and Reeths Puffer Public School Systems as well as N. Muskegon Elementary and at several private schools starting April 28. Entry forms will also available at the Muskegon & Muskegon Township Police Departments starting April 28. The derby will be held on Thursday, June 12th, 2014 at 4:00 p.m. at Fisherman’s Landing. Youth must be pre-registered in order to participate. Registration ends on June 9th or when the maximum number of entrants has been reached. There will be awards for largest fish in each age group (8, 9, 10, 11 & 12) as well as door prize drawings and a hot dog roast. The fishing will end at 6:00 p.m. at which time the hotdog roast and prize drawings will begin. 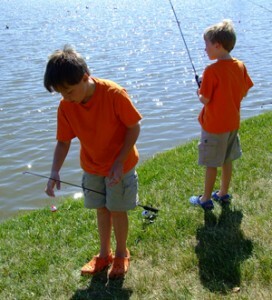 Rod & reel combinations will be available to those youth that do not have access to their own fishing equipment. This equipment will be theirs to keep after the event Those who participated in previous year’s derby’s and those who have their own equipment may still sign up to participate; however, they will not be eligible for the free equipment. The derby is limited to 200 total participants and registration is on a first come, first served basis. The entry/waiver forms must be hand delivered to the Muskegon or Muskegon Township Police Department no later than June 9th (do not mail the forms). Once we have reached the 200 limit we will stop taking entry forms. and other city staff that help make this event possible.